Here’s the truth: They’re not going to. Not today and not tomorrow. There are simply too many other services competing for the limelight for customers to start talking about your brand online without some sort of impetus. It’s your job as a marketer, therefore, to force the conversation about your company. You need to start an interesting dialogue that will get people thinking about a critical problem that is happening in your industry. Only after you spark such dialogue will consumers come around and look to your brand as an industry leader. In so doing, the spark will ignite into an inferno—fueled by social shares and likes, increased Web traffic and customer inquiries over the telephone and Internet. What’s the best way to light this bonfire? One way is by holding a webinar. The great part about holding a webinar is that you get to control the dialogue. In many ways, it’s like having home court advantage in a sporting event, especially when using a service which allows you to customize your webinar platform with your logo and company colors). When preparing to launch a webinar, choose the topic that you feel will resonate best with your customers. Plan to invite industry experts to present in addition to your in-house staff to offer participants more in-depth coverage of the topic. Then, sit back and watch the dialogue catch fire. Stop waiting for your customers to start talking about your brand; get the conversation started yourself! 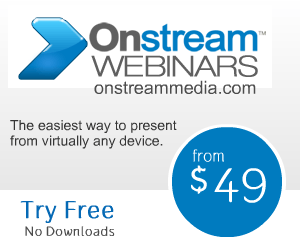 Click here to learn more about how Onstream Webinars can help.